Adeptus Mechanicus, Imperial Knights, Astra Militarum and Thousand Sons: Synapse, Shadow of the Warp and stuff! Wow! 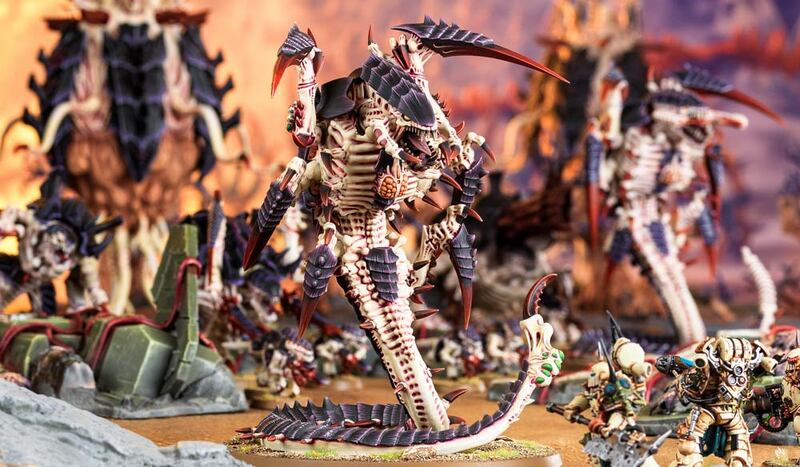 Warhammer Community has released a preview on Tyranids (I know I'm late to the party, I just got back from college), and they look absolutely terrifying! Especially for my poor Guardsmen (huh, wonder how that's going to work against my Imperial Knights, though). Okay, so we already know we have seven Hive Fleet Adaptations. 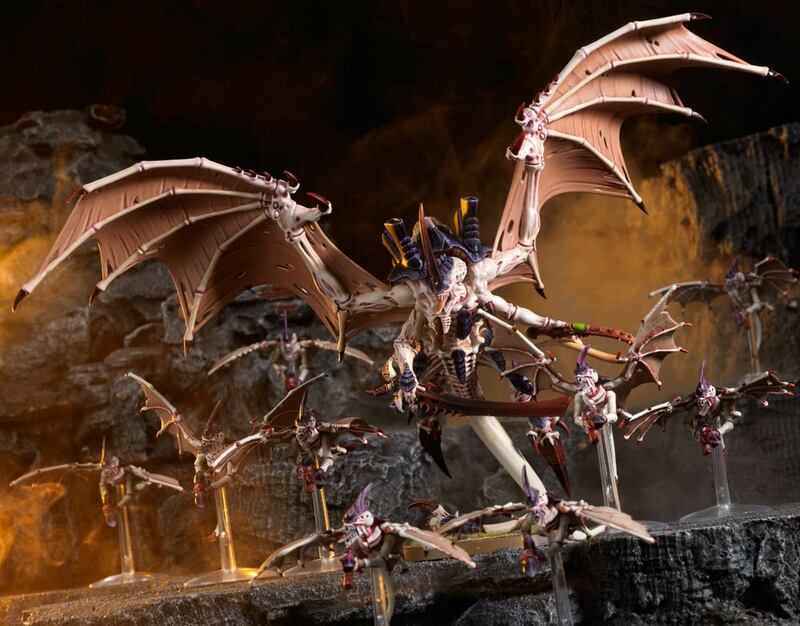 What else do the new Tyranids bring to the table? Oh gosh, that looks absolutely terrifying. Gulp. 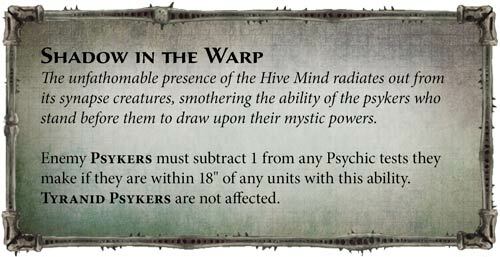 Apparently, the updated terrifying Tyranids are more manoeuvrable, more dangerous to enemy psykers (my Primaris Psykers!) and even more resilient to morale tests. Just look at this. Anyway, that's quite the 50% increase in range, Shadow in Warp extending from 12" to 18" and Synapse from 8" to 12". Not bad. 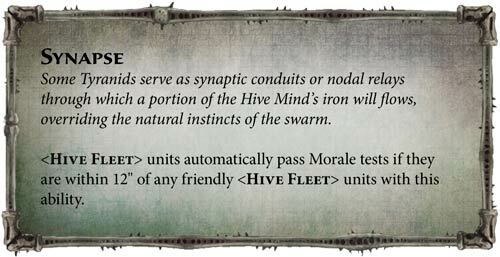 That's pretty sweet, and it'll be easier for you Tyranid players to keep your bugs in Synapse range now. Damn it, and they went and nerfed the Commissar. Sigh. 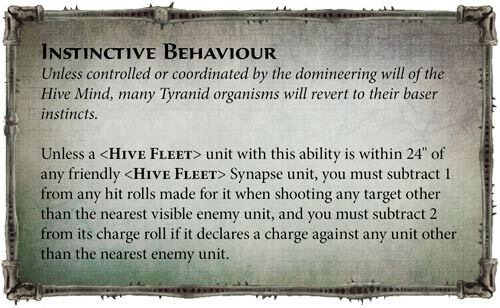 Oh, and they changed Instinctive Behavior, which only allowed your Tyranids to shoot and charge at the closest unit before. If they weren't within 24" of a Synapse unit, that is. Awesome. Now it's just deduct 1 or 2 from your rolls. That still gives me the strategic advantage if I aim and kill your Synapse units first, but doesn't turn it into an auto-loss for you guys. But 24"...holy Terra, that is a lot! I feel like building a Nidzilla army now. Oh well. 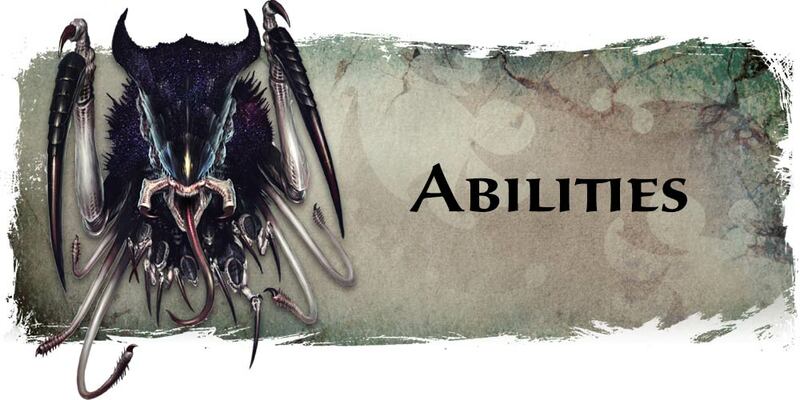 Anyway, we'll be looking at the Hive Fleet Adaptations tomorrow. All seven of them in one day. That's correct. 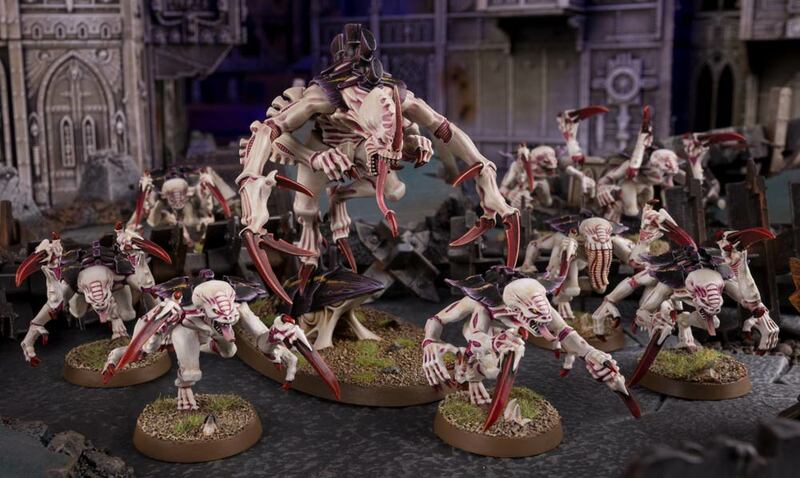 Well, I know I'm missing out on spoilers because people have already leaked what all the seven Hive Fleet Adaptations are, but well...I'm going to just stick with Warhammer Community so that I have something to update my blog daily. Anyway, see you tomorrow, and I'll go prepare my Guardsmen to face the terrifying Tyranid armies!